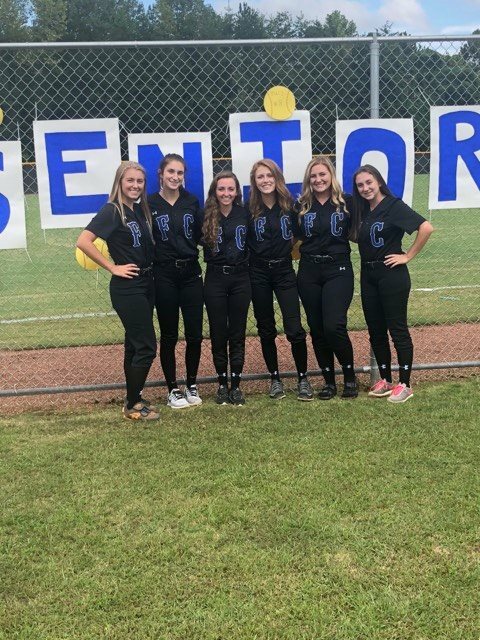 On 9/25, the Lady Rebels softball team prepared to take the field for their last home game as they took on Dawson County. Although the night came with many emotions, the Rebels were determined to play their last home game with everything they had. Fannin took the field in their all black uniforms, ready to put up a fight for a win. The Lady Rebels wanted a win and you could tell by their performance on the field. The Rebels had a solid defense for two innings where they kept the Tigers from scoring any runs. All of the seniors played a huge role in Fannin’s defense for the night. Maleah Stepp in center and Reagan Young in right had a great night in the outfield full of great catches, Kyla Seabolt was aggressive at third base where she got big outs, Macy Galloway at short and Alicia Jones at second had some great snags in the infield that resulted in outs, and Amelia Sneed pitched a great game where she struck out five batters. As Fannin held Dawson on defense, the Rebels started to make things happen on offense. Stepp and Jones led the Rebels in hits for the night with two a piece. Over the first two innings, Fannin scored one run in each, resulting in a 2-0 lead. The teams reversed roles for the next two innings where Dawson took the lead. The Tigers scored two runs in both the third and fourth inning as they held Fannin on defense. Dawson was ahead 4-2 going into the fifth inning when they managed to add another run to their score and held Fannin. Both teams put up a fight in the sixth inning where they refused to let the other score. Fannin finally broke the trend at the bottom of the seventh inning where they scored two more runs. Although the Lady Rebels out hit the Lady Tigers 8 to 3, they were unable to put the runs on the board to catch up to Dawson. After an intense back and forth game, Fannin endured a heartbreaking loss of 5-4 to the Lady Tigers. Fannin’s loss put their overall record at 10-13 and their region record at 3-8.